Ancient Greek Sandals are handmade in Greece by skilled craftsmen using traditional techniques that have existed for centuries. A raw, yet feminine aesthetic distinguishes this new sandal brand. The chemical free, natural tan leather ages beautifully with time and wear. Sandals are embellished with a "golden wing" buckle as an homage to the flying Greek God Hermes. Co-Founders, Christina Martini and Nikolas Minoglous's love for Ancient Greece and its history, combined with their individual technical skills naturally led to the creation of ‘Ancient Greek Sandals’. The collection is inspired by ancient Greek Gods and myths, pottery, jewelry and sculpture. There's very little to this sandal, although the screw detail is gorgeous. I found the thong piece to be uncomfortable (which is never an issue for me) and overall it's a very minimal sandal better for a beach day than city walking. Couldn't justify the high price for the lack of utility. Good looking and comfortable sandal. Even with a high instep, wasn't too hard to get into (imagine it would get even more comfortable once broken in). But for me, it wasn't supportive enough to warrant the price as it's not an all-day walking sandal. Lovely gold that would look beautiful with a tan, but I didn't enjoy the fit of this sandal. It had more of a flip flop feel to it in that the straps, no matter how tight the notch, had too much elasticity to hold it to the foot without effort. I’m shocked at the price due to the fact that there is absolutely no support. They also run a size too small. These run small! I'm a 6.5 in most brands, so I ordered a 7. My heel stuck out the back. Love the sandals and will order a larger pair. I've never bought a shoe larger than a 7, so these definitely run small. Really wanted to Love these shoes and they were comfortable and fit well, just did not look good on my feet. Love these. They seem very comfortable and stylish. However they run as out half size too small and next size is most likely going to be too big. Sending back and will size up! I have the Ancient Greek Sandals and ordered directly from the makers in Greece - bad design, bad fit, horrid customer service (tried to exchange them and one email back but no answer afterwards), just a bad decision to buy these sandals where the main strip on one foot is longer than the other and the sellers / manufacturer didn't even care to explain or try to exchange them. Just a bad investment overall. Don't waste your money on these sandals. Poor quality and service. Beautiful shoe. Super soft leather. I am 9.5 ordered 40 (10) it’s perfect. 41 was too long. They are comfy. But need some breaking in. Gold color is very pretty. You can wear them dress up or down. These sandals are summer perfection. The leather is such high quality and they're very comfortable once you get the sizing correct. I'm a size 7.5, sometimes 8, and I had to return the 38s for a size 39. I've never worn a size 9 shoe in my life, so these run extremely small. I bought these in rose gold. 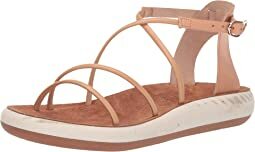 These sandals are absolutely amazing -- so soft ( buttery leather) very elegant looking and make your feet look slim. It is so hard for me to find shoes that fit --- and these are out of the bog amazing. They are flat , not much arch support, but still feel and look great. I am 9.5 and I bought 10 ( 40) and they feet great. the next size up ( 41 or 11) was way too big and wide. These run small. I'm normally a size 8, and the 38 was way too small. I ordered a 39 ... stay tuned to see how that fits. Super cute and stylish! No arch support but the leather is buttery soft and will definitely mold to your feet. Runs small! Size up!